What is it about the Lib Dems and Sci Fi? January 31, 2014, 4:53 p.m. Here at YouGov, we have been surveying our 400,000 strong UK panel of respondents for years, on subjects ranging from their political opinions to their shopping habits, favourite movies to what they do on a Saturday afternoon. We’ve built up a fascinating database that connects all aspects of people’s lives – we call it the Cube - and it reveals some weird and wonderful connections between things. Over the coming weeks we’ll be sharing some of the more intriguing connections as we discover them. To begin with, we’ve been noticing something for a while that we can’t make much sense of: there seems to be a correlation between an interest in Sci-Fi and supporting the Liberal Democrats. It all started in May last year, when we ran a survey on Star Wars and Star Trek. Asked which series they prefer, the country as a whole narrowly prefers Star Wars (29% to 27%). But Liberal Democrat supporters buck the trend, with 36% preferring Star Trek and 20% preferring Star Wars. The following month we ran a survey on Doctor Who and noticed that while 31% of Brits take an interest in the programme, this rises to 41% among Liberal Democrats. So far, it could just be an anomaly. But then we started looking things up in the Cube (which happily is also the name of a Sci Fi Film). Time and time again the Liberal Democrats appeared as the most correlated political party for Sci-Fi related topics (try searching for things in the search box above). 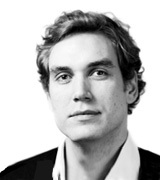 Movies like The Matrix, Blade Runner, Alien, The Fifth Element, Stargate, Back to the Future and Close Encounters of the Third Kind and sci fi classic books like Hitchhikers’ Guide to the Galaxy, Dune and I Robot – ALL show positive correlations to support for the Lib Dems. In order to be certain, we then ran an analysis of the 100 TV programmes that are most particularly favoured by supporters of each of the three main parties. 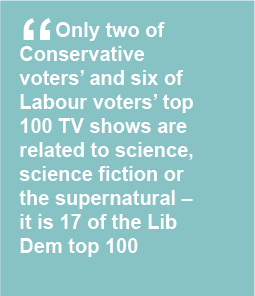 Sure enough, while only 2 of Conservative voters’ and 6 of Labour voters’ top 100 TV shows are related to science, science fiction or the supernatural, it is 17 of the Lib Dem top 100. The full results will be published next week, but in case you’re wondering the list includes Doctor Who, Red Dwarf, Futurama, Being Human, Buffy the Vampire Slayer and Tomorrow’s World.